Testifying about and sharing the Word effectively is one of the most important skills for any believer. A person’s witness can be both a benefit and a detriment, as contradictory as that may sound. Just as our tongue can be used as an instrument to bless Yahweh and curse man (James 3:9), our testimony can have the same result. We are instructed to let our light shine (Matt. 5:16) and to have a ready answer to all who may ask. How then does a person witness in a way that is both persuasive and a blessing to Almighty Yahweh? 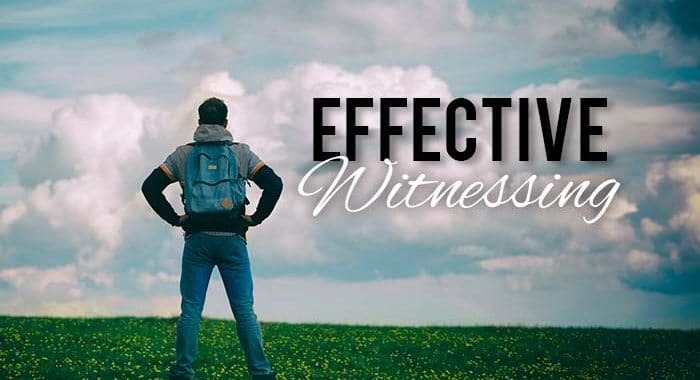 What are some of the methods of effective witnessing? Surprisingly, the Word provides many. The most important of all is the primary use of Yahweh’s Scriptures themselves. All other approaches are built upon them. 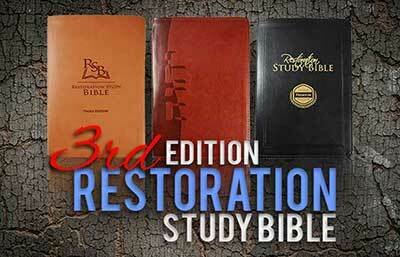 We find in the Book of Hebrews that Yahweh’s Word works in powerful ways. The author of this dynamic, ageless book, wrote, “For the word of Elohim is quick, and powerful, and sharper than any two-edged sword, piercing even to the dividing asunder of soul and spirit, and of the joints and marrow, and is a discerner of the thoughts and intents of the heart” (Heb. 4:12). This passage compares the Word to a two-edged sword, which is able to discern the thoughts and motives of the individual. Understand that when we witness that we are engaged in a spiritual battle. Satan wants nothing more than to discourage us from sharing the Truth. There is no weapon more powerful to oppose Satan than the Word. Another advantage of using the Word is that it keeps personal opinion or bias from entering the discussion. In sharing the Scriptures avoid statements like, “I think” or “I believe.” Instead, simply say, “The Word says.” Who can refute the inspired text? When Yahshua the Messiah taught He typically used and referred directly to the Scriptures. There are many examples of such in the Bible. One instance is when He was confronted by Satan after His immersion. “But he answered and said, It is written, Man shall not live by bread alone, but by every word that proceeds out of the mouth of Elohim…Yahshua said unto him, It is written again, you shall not tempt Yahweh your Elohim…Then saith Yahshua unto him, Get thee hence, Satan: for it is written, you shall worship Yahweh your Elohim, and Him only shall you serve” (Matt. 4:4, 7, 10). How did Yahshua respond to Satan’s direct temptations? In every instance He replied, “It is written…” There is no example where the Messiah prefaced His response with, “I believe” or “I think.” He simply referred to the Word. No greater weapon stymies the Evil One more than the pure and unadulterated Truth of our Father in heaven. Personal opinion or man’s thinking means nothing compared to the Word. It matters not what we believe. If we cannot prove what we believe then we have a problem that must first be reconciled with the Word. When we evangelize, what we say must be based on the truth of Scripture. One of the best ways of ensuring this is to simply quote pertinent verses. Another instance of this approach can be found in the evangel of Mark: “He answered and said unto them, Well hath Isaiah prophesied of you hypocrites, as it is written, This people honors me with their lips, but their heart is far from me” (Mark 7:6). Yahshua could have attacked these men with personal judgment, but instead He simply yielded to the Word. 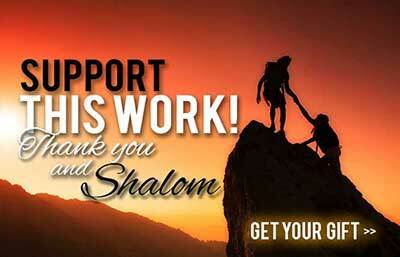 As was seen in Hebrews, nothing is more impacting than the inspired Word of Almighty Yahweh. Yahshua understood this well. This is why it is so important that all believers make time to study the Word. How can we refute a false belief if we do not have adequate knowledge of the Truth? Another key to witnessing is finding similarities, meaning focusing on those aspects of truth that might be shared. The Apostle Paul frequently used this method with often incredible results. One example can be found in his witness on Mars’ Hill. “And they took him, and brought him unto Areopagus, saying, May we know what this new doctrine, whereof thou speakest, is? For thou bring certain strange things to our ears: we would know therefore what these things mean. (For all the Athenians and strangers which were there spent their time in nothing else, but either to tell, or to hear some new thing.) Then Paul stood in the midst of Mars’ hill, and said, Ye men of Athens, I perceive that in all things ye are too superstitious. For as I passed by, and beheld your devotions, I found an altar with this inscription, TO THE UNKNOWN MIGHTY ONE. Whom therefore ye ignorantly worship, Him declare I unto you. Elohim that made the world and all things therein, seeing that he is Sovereign of heaven and earth, dwells not in temples made with hands; Neither is worshipped with men’s hands, as though he needed any thing, seeing he giveth to all life, and breath, and all things” (Acts 17:19-25). On this occasion, Paul used the object with the inscription “to the unknown Mighty One” to connect to his audience. Paul was basically saying, “Let me tell about this One whom we worship.” In doing so, Paul was forming a relationship between him and his hearers. It is also noteworthy that Paul began his witness at creation. Since the “Athenians and strangers” were ignorant of Scripture, Paul began at the beginning to build a foundation. Two lessons can be derived from this example: (1) similarities may be found even in the most difficult of situations, and (2) it is often necessary to build a foundation. If we focus only on our differences, we remove the motivation for the listener to change. Part of witnessing is building a relationship. A relationship is very difficult when there is no common ground to build on. Another time that Paul used this approach is in his first epistle to the Corinthians. “For though I be free from all men, yet have I made myself servant unto all, that I might gain the more. And unto the Jews I became as a Jew, that I might gain the Jews; to them that are under the law, as under the law, that I might gain them that are under the law; To them that are without law, as without law (being not without law to Elohim, but under the law to Messiah), that I might gain them that are without law. To the weak became I as weak, that I might gain the weak: I am made all things to all men, that I might by all means save some” (1Cor. 9:19-22). Paul’s statements here again illustrate his strategy of forming a bond with his audience through similarities. He said that he became a servant to all so that he might gain the more. How did this great Apostle become a servant? To the Jews he became a Jew and to those who were without law as one without law. Is Paul saying that he followed all Jewish traditions or lived without law to win more to the faith? Absolutely not! The Apostle is stating that he found common threads with those groups and used similarities to win them to the Messiah. Solomon understood that excessive study could be a detriment. The same applies to witnessing one’s faith. Most individuals are capable of receiving only so much information at a time before reaching sensory overload. The limits will vary with the person, of course. The best approach is to volunteer a little and then let them ask for more. If we are not cognizant of this principle we may make it very difficult for our listener to retain the knowledge we share or worse, may discourage our listener from being receptive to future teaching. Let them digest a little at a time. Balance and moderation are keys to successful witnessing. The detriment of excessive knowledge and the need for moderation did not escape the Apostles and elders of the early assembly. They applied this principle to the first wave of gentile converts. “Wherefore my sentence is, that we trouble not them, which from among the Gentiles are turned to Elohim: But that we write unto them, that they abstain from pollutions of idols, and from fornication, and from things strangled, and from blood. For Moses of old time hath in every city them that preach him, being read in the synagogues every Sabbath day” (Acts 15:19-21). In this passage the Apostles and elders were gathered to discuss what was to be done with the new gentile converts regarding physical circumcision. The conclusion of this meeting was that circumcision would not be required of those uncircumcised gentile converts. The reason is important. Scripture says that the elders and Apostles would not trouble the gentiles with circumcision because they understood that to burden them at this time with that requirement would have been excessive and a detriment. Instead of requiring circumcision, the Apostles commanded that they begin their walk by abstaining from four specific practices that were all connected with their previous pagan worship. The rest of the Truth they would learn in due time as they met each Sabbath to hear the law as given on Sinai. To avoid discouraging the early converts, the Apostles and elders saw the benefit of allowing them to learn gradually. Give then only a little at a time and make them hunger for more. Witnessing is like sowing a seed. When a seed is planted only a small amount of water is needed. Give it too much and it might wash out. But as the plant grows greater amounts of water are required. This same concept holds true for witnessing the Word. When planting the seed use moderation and discretion and don’t inundate. In addition to having self-control we should never attack or belittle another’s beliefs. That will get us nowhere. An example of a right approach can again be found in Paul encounter on Mars’ Hill. “Then Paul stood in the midst of the Areopagus and said, ‘Men of Athens, I perceive that in all things you are very religious’” (Acts 17:22, NKJV). Notice that instead of attacking these people for their pagan worship he said that he perceived that they were very interested in religious things. He himself was more religious too, so he found common ground with at least their desire to investigate. Paul understood that to attack their faith would have been counterproductive. Witnessing with aggression and a desire to humiliate is not only self-defeating, but also reflects poorly on the Faith. Personal attacks should always be avoided. They will only escalate contention and frustration. Even when he was confronted with pagan worship Paul had a way of approaching the situation in a manner that disarmed them and connected with his listeners simultaneously. Yahweh’s people should follow this example. His approach is dignified, sincere, and effective at drawing them in to desire more of Yahweh’s Word. Our Savior commanded us to allow our light to shine so that our good works would be a positive testimony to Yahweh. Someone said, “You may be the only Bible someone else reads.” The examples that we set by our lives may indeed be the only model of truth that some will ever experience. With this principle in mind, it is crucial that we live daily according to the Word. It is important that we understand that our examples can either be a blessing or an obstacle. If we willfully commit sin then we may discourage others from the Faith. For a believer, hypocrisy is not an option. As our Savior lived a life free from sin, we must strive to do the same. “For even hereunto were ye called: because the Messiah also suffered for us, leaving us an example, that ye should follow his steps: Who did no sin, neither was guile found in his mouth” (1 Peter 2:21-22). No matter what situation we are discussing, living a life that reflects our Savior can lead others to change and to accept the truth of Almighty Yahweh. Whether it is a wife trying to win over her husband or a believer trying to win over a friend, we must always set a right example. If our examples contradict our words then we lose credibility and what we say will fall on deaf ears. In addition to the other techniques, patience and refraining from anger are indispensable when witnessing. Solomon in Proverbs 15:18 wrote, “A wrathful man stirreth up strife: but he that is slow to anger appeaseth strife.” According to Solomon anger creates more strife. Our discussion may already be fragile and adding emotion will only push it over the edge and defeat our goal. Our goal should be to ensure that our witness is a positive experience for both us and the person we are communicating with. Being impatient and argumentative will ensure that this won’t happen. While anger causes strife, patience calms strife. When we witness we must learn to control our emotions, especially anger, and to be patient. Remember that in many cases, it is not what we say but how we say it. When we confront someone face to face they see our facial expressions, which speak just as loudly as what we may say. If what we say is in strife, then no matter what validity we may have it is all for nothing. It is also important to remember that not everyone is on the same spiritual level. While some may accept certain truths quickly, others may not. This is why patience is a virtue when witnessing the Word. In other words, we are not to share Yahweh’s word with those who would reject or pollute that Word. If discretion and wisdom are not used then our witness may not only fall on rebellious ears, but may also come back to bite us. In 2 Peter 2:12 we find that there are some who are “as natural brute beasts, made to be taken and destroyed.” These people have no regard for Yahweh’s Word and will destroy it if possible, especially that which is holy. This is the reason we are told to abstain from sharing the Truth with those who would scorn, abuse, and defile it. The last principle to understand is the one that often causes the most frustration. When we witness we must learn to wait on Yahweh and to accept His will. Even though our witness is often motivated from a deep desire to see a person change, we must understand that only Yahweh can change hearts and minds. In many cases, regardless of the evidence we present or how well we may articulate our words, it is not meant for some people to see the truth. Not everyone is called at this time. In this passage Yahshua explains that he spoke in parables to avoid revealing the truth to those whom it was not given. It is not Yahweh’s desire that all receive knowledge of His Word today. A truth that is often missed by many Bible believers is that today is not the only day for salvation. Scripture speaks of two resurrections, one for the saints in Messiah (1 Cor. 15:23, Rev. 20:6) and one for the rest of mankind (Rev. 20:11-15). All of mankind at some point will have an opportunity to learn and accept the promise of salvation; some have that opportunity today, while others will have that opportunity in the future. Keep this principle in mind when sharing the Word. Yahweh may have a reason for not revealing his truth at this time to someone we might know. Even though it may be disappointing, we must have faith that Yahweh is in control and has a plan for those whom we love. Life often has a way of taking turns we cannot always foresee. When our witness does not take root then we must leave that seed to Yahweh. From the Apostle Paul we learn that only Yahweh can bring forth the increase. “Who then is Paul, and who is Apollos, but ministers by whom ye believed, even as the Master gave to every man? I have planted, Apollos watered; but Elohim gave the increase. So then neither is he that planteth is any thing, neither he that watereth; but Elohim that giveth the increase” (1Corinthians 3:5-7). In this passage we find that while we can plant and water, we cannot bring fourth the increase; only Yahweh can produce the fruit of our labor. Yahweh is the only one who can open eyes and change hearts and minds of men. Even the greatest orators in the history of man have failed to convince some. Wait on Yahweh. To witness the Word effectively we must use discretion and wisdom. We must engage those techniques that cultivate success and avoid those that only offend. Considering the weight and significance of our witness, it is of necessity that we strive to present the best witness possible. Our witness can be both a benefit and a detriment; may our witness not be of the latter. ← What Happens After This Life?